Can you believe it’s time to start thinking about Christmas?! Or maybe you are one of those people who can’t stand it when the Christmas decor comes out early and everyone starts putting up Christmas posts and talking about Christmas when it’s still Fall time and the leaves are still changing color. Well, let me tell you there are reasons we start on Christmas early. If you like a Handmade Christmas, you HAVE to start early! At least I do – there just are not enough hours in the day to get it all done if I wait till December. So if you can’t abide Christmas talk yet, then I suppose you can just mosey on your way – you could hop over here to see some fun fall decor. Or meander this way to see how I used natural elements to create a fall display. 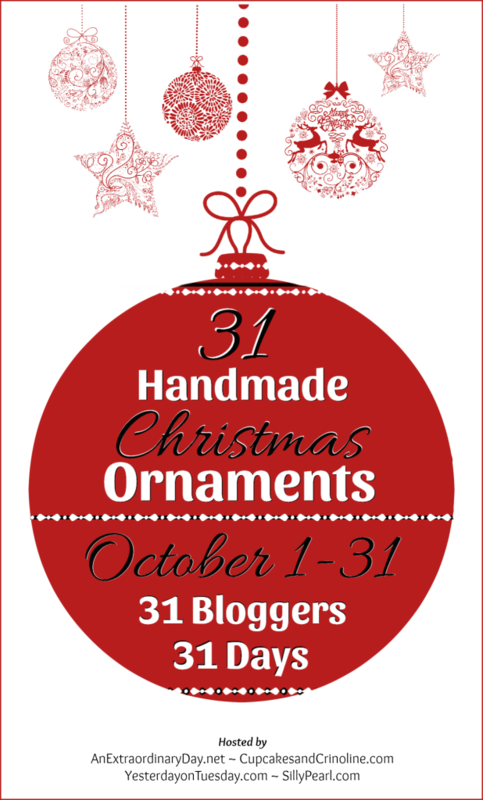 But I will tell you that if you stick around you are guaranteed to get inspired to create some handmade ornaments for Christmas! 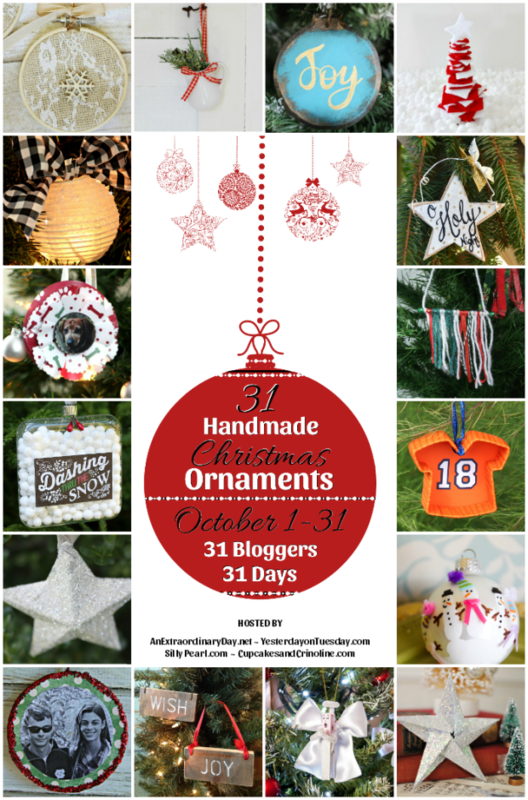 You see, it’s not just me who is bringing you a handmade Christmas ornament – I’ve teamed up with some uber talented bloggers to bring you 31 days of Handmade Christmas ornaments! 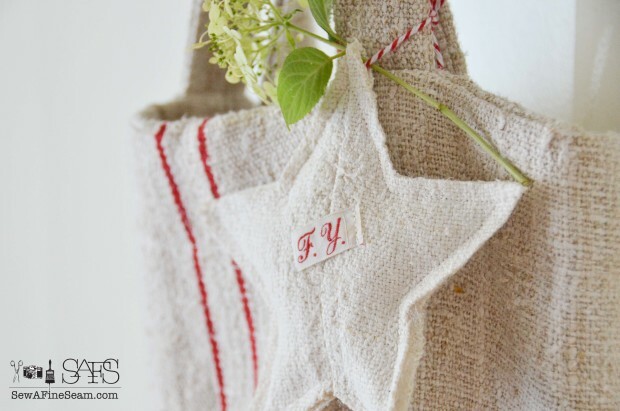 These Star ornaments are made from a European Grain sack and they are so simple to make. You can use any fabric that suits your style and decor. 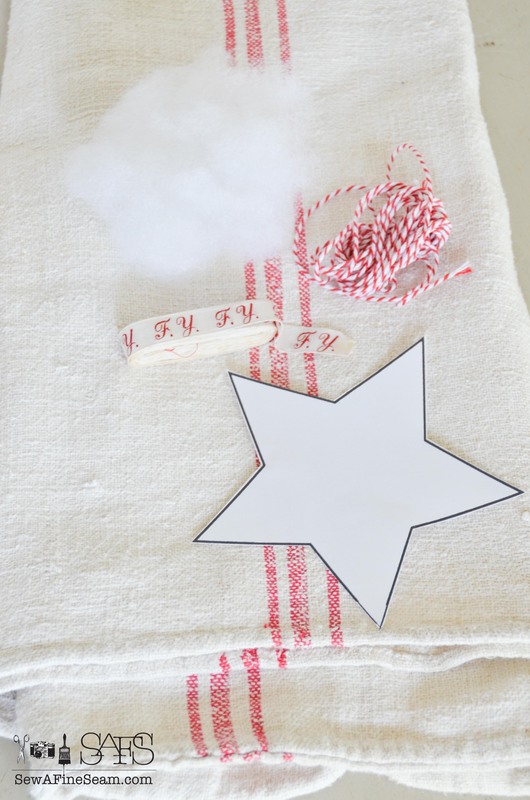 Gather your supplies and grab a pair of scissors to cut out the stars. • Cut a piece of twine or ribbon and fold it in half to form a loop and place it on one point of the star. 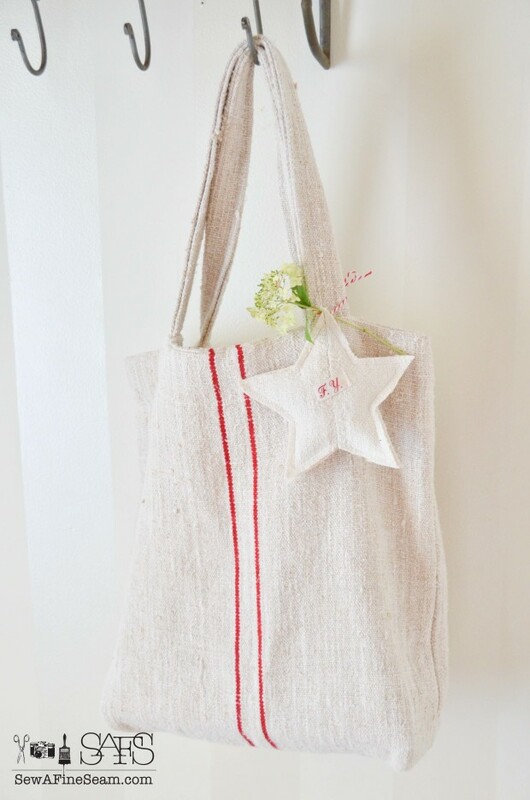 • Place the wrong side of another star piece on top of the first, sandwiching the fiberfill and the ends of the twine between the two stars. 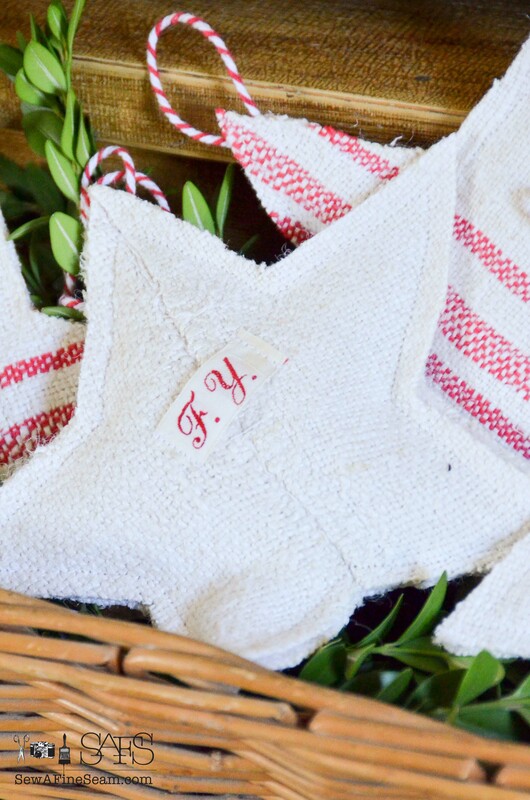 • Stitch the edges of the star making sure to catch both ends of the twine in the seam. So simple and easy and fun! Add one to your favorite bag for the holidays too! 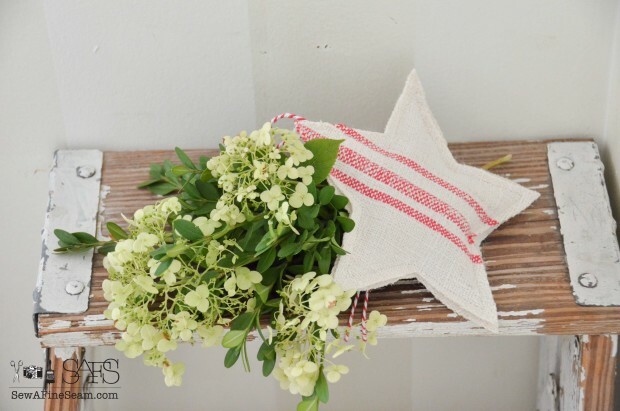 These are fun for more than just the tree too – you can tuck them here and there with some bits of greenery or hang them on your chalkboard or from the corner of a picture frame. I added a bit of vintage lettered ribbon to the edge of this one for a fun bit of whimsy. Now that you see how easy and fun these grain sack star Christmas ornaments are, lets go see some other great Christmas ornaments crafts you can make. Create a fun, cozy, handmade Christmas this year! Here is a little preview for you of the first 15 days of the month! Aren’t they amazing?! You can find links to all these at the bottom of the post! And here’s the second half of them month’s awesome handmade ornaments! Find links to them all below. Here are all 31 Bloggers in order of their appearance over the 31 Days. Jill thess are so adorable!!! Jill, these are so lovely! 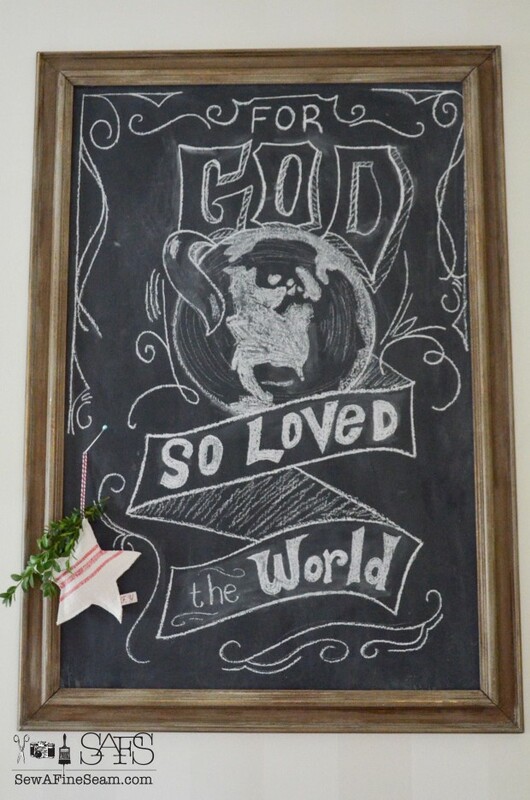 They go perfectly with your chalkboard art and the tote as well! Thanks Steph! I love them and need to make some more – if I can find the time! They look so awesome on a tree – I used these on my tree a couple years ago. Your ornament is lovely, Jill! I was just browsing some of your other posts (and swooning!) – you are so talented. I’m happy to be a part of this hop with you. Thanks Mary Beth! This is really a fun hop isn’t it?! 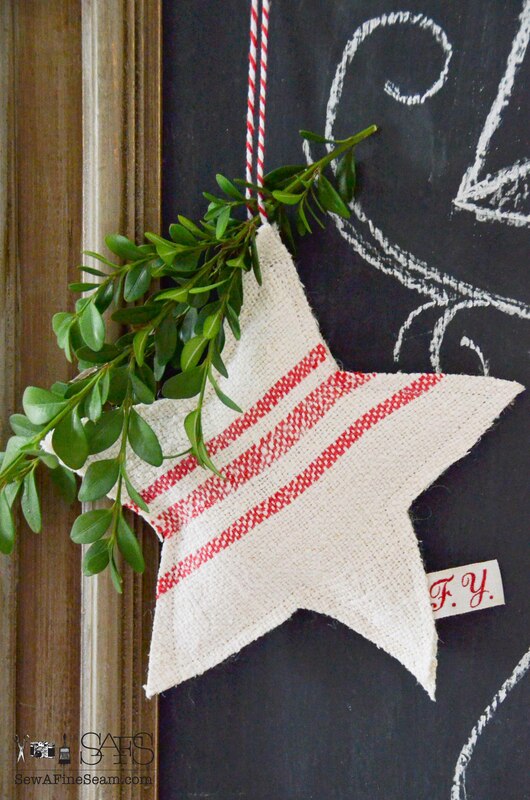 Great stars for ornaments. Where can person find grain sacks? Would sure love to make some of these, simple and so sweet and homey looking.Any suggestions? Your stars are just what I love to make and gift. Love texture of your grain sacks. How wide is your star? If I don’t write as much as usual it’s because hands are being very difficult, keep going their own blasted way and i lose comments too often anymore. What a relief huh? Need pc that types for me as i talk into it. Have great weekend end.You are a great lady. 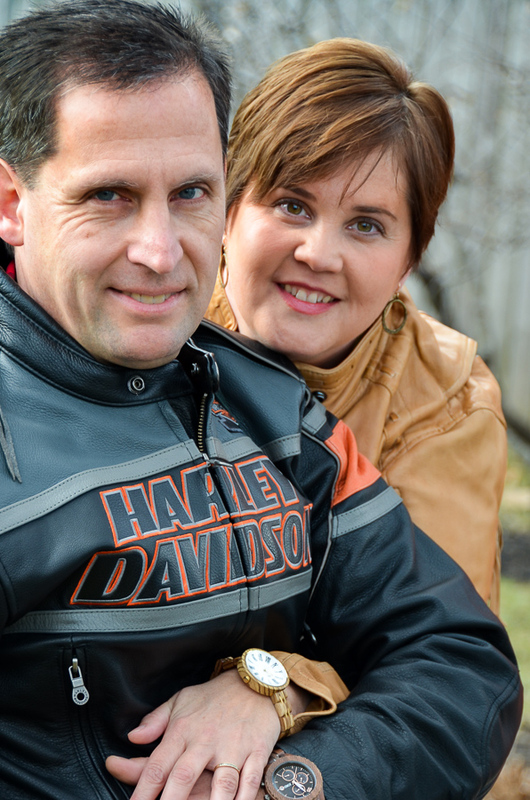 Search ebay or local flea markets or shops JaneEllen. I have some I need to get in my online shop but I’m not sure when I’ll have time. I love these, Jill! They will look great in so many places for Christmas and they’ll make great gifts as well. I need to find fabric and make a few of my own. Would you mind sharing where you get yours? Hi Paula, these would make awesome gifts! I get some of my grain sacks on ebay or I pick them up here and there at flea markets. I recently imported a bunch from Europe and need to get some listed online for those interested. Love your ornament Jill! I think I can even make one and I have very limited sewing skills. I think these would also make great Christmas gift tags. Pinned. Thanks Kelly! These are easy enough for beginners I’m sure – if you know how to run a sewing machine I KNOW you can make these! Tania, thank you so much – these are so simple to make! Jill, These are adorable! You’re so right, it’s about time to start making these to use as decor and as gifts. Thanks Cristina, I want to be crafting ornaments very soon! Handmade is just so fun! 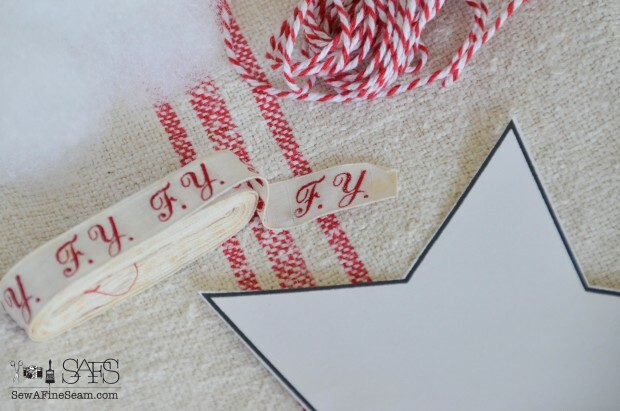 These are so fun and if you have all the materials needed you are halfway done already! thanks Malia! These were so fun to make! Thanks for including me Diane! These are precious Jill! I have some fabric scraps and would love to make some of these! Pinned! These are so easy and fun to make Angie – I know you could whip some up pretty quick! Just cute as can be Jill! These are so pretty, I have some tea towels in similar fabric that would work great for these. Thanks for the idea. Oh tea towels would be a perfect thing to use for the fabric for these! I’ll have to keep my eyes open for some fun christmas tea towels to ‘repurpose’! I love them too 🙂 So easy and fun to make! So cute! I love them. Thanks Robin, I love them a lot too! I need to find time to make more – I have clients asking for them but I’ve had to say no for now. Thanks Debbie, they were really fun to make! Oh so pretty! You know I love these!! I’m glad to know that I’m not the only one daring to think about Christmas so soon. I even loaded Christmas music on my phone last night. Love your ornaments! 🙂 Seriously it will all of a sudden be right on top of us and I am always behind the way it is! I could start in January preparing for Christmas – especially now with the business. I can’t even get ahead of things with that I’m so swamped! It’s a good thing but wow it can be stressful juggling it all! 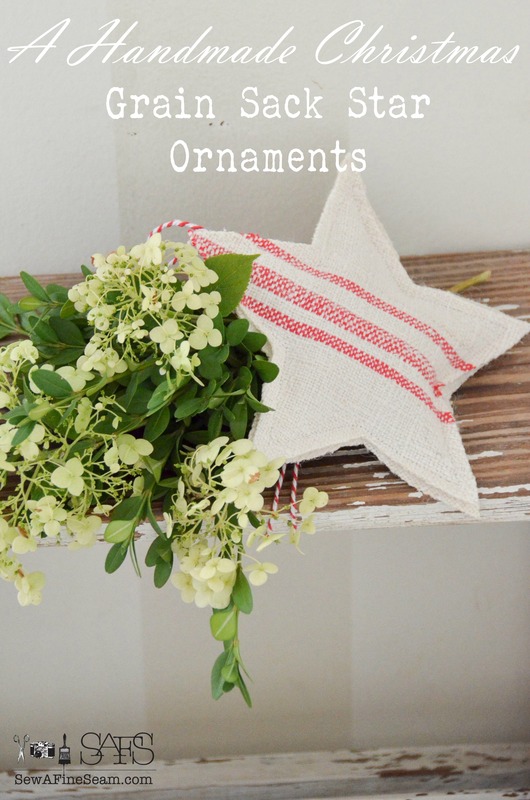 What a darling ornament and how beautifully styled! I love that you personalized it too! This will certainly be a family heirloom! I adore these ornaments. 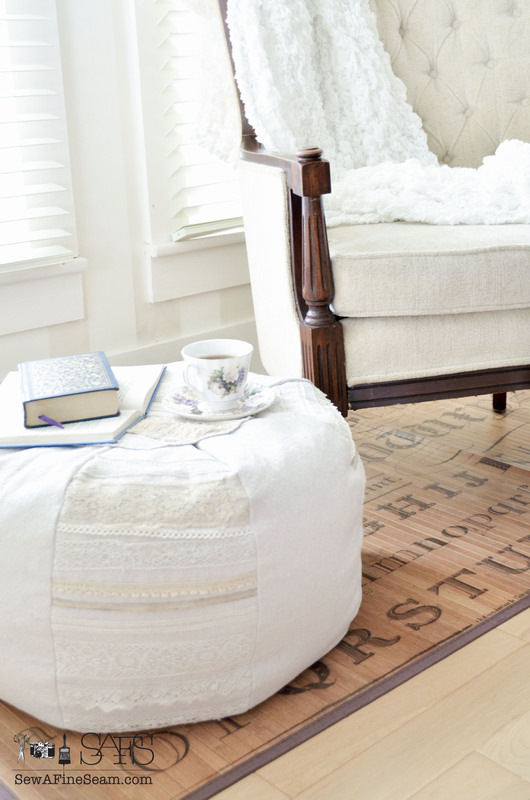 They are perfect in their rustic simplicity. What a fun and easy project to start crafting a handmade Christmas with. 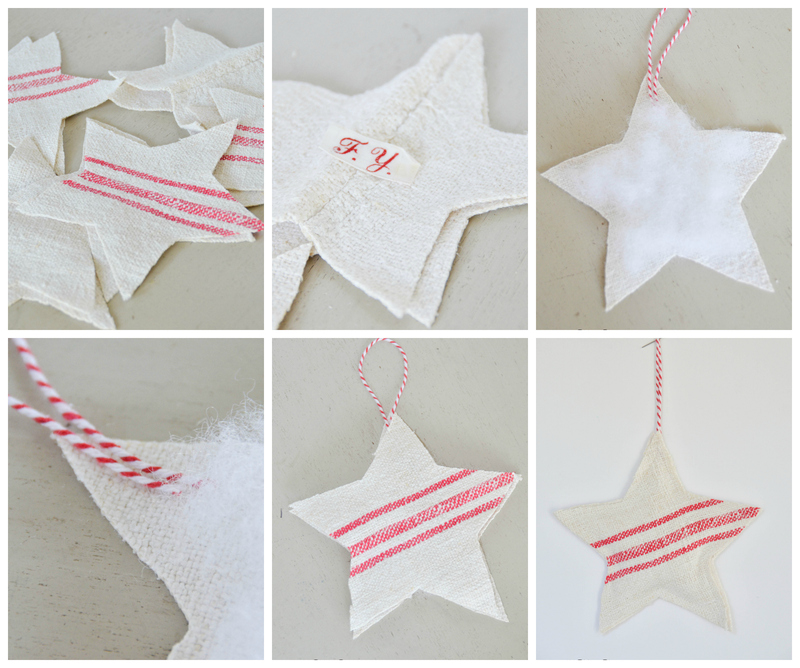 Thank you Holly, they are so easy and fun to make and look so sweet on a tree!